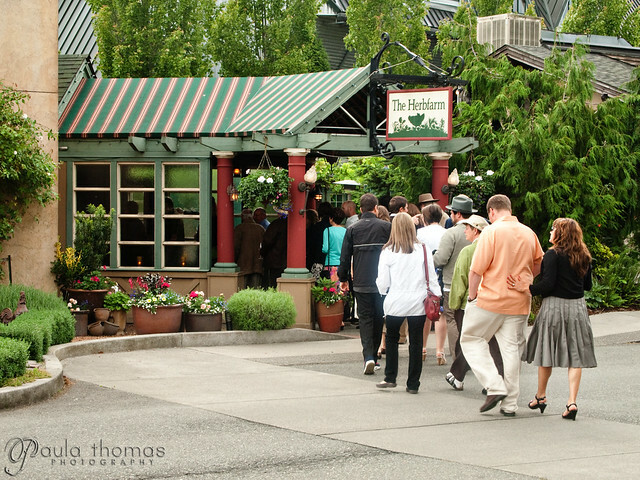 For my birthday this year, Mark bought me dinner at the Herbfarm. I've always wanted to go but never have gone mainly due to the price but I had hoped to go some day. 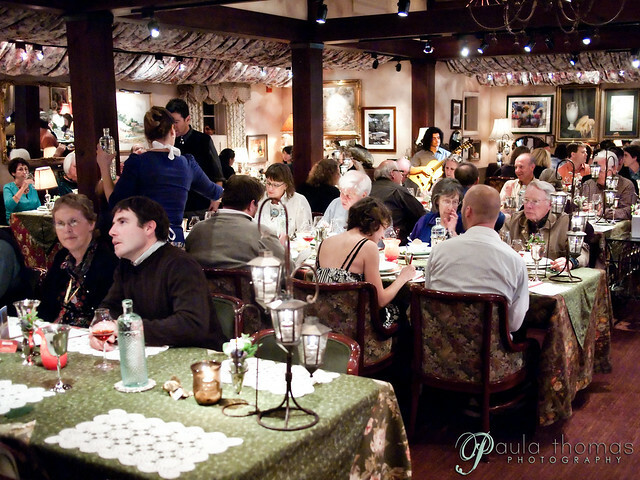 I saw Ron Zimmerman, owner of the Herbfarm tweet about a special cider dinner they would be having in June. I looked into it and it was only 6 courses compared to the 9 courses they usually have. I always thought 9 courses was just too many. 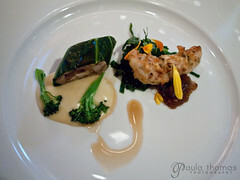 Since there were less courses the price was also reduced which made it even more appealing. I'm also a fan of cider and all the pairings for this dinner were from local hard cider makers, most of which were present at the dinner. So it seemed the perfect time to check the place out. I arrived a little early after spending some time at Molbak's looking at and buying a few more herbs for my herb garden. I was served a glass of Eaglemount Homestead cider followed by a cherry cider by Tieton Ciderworks while mingling with a few people. 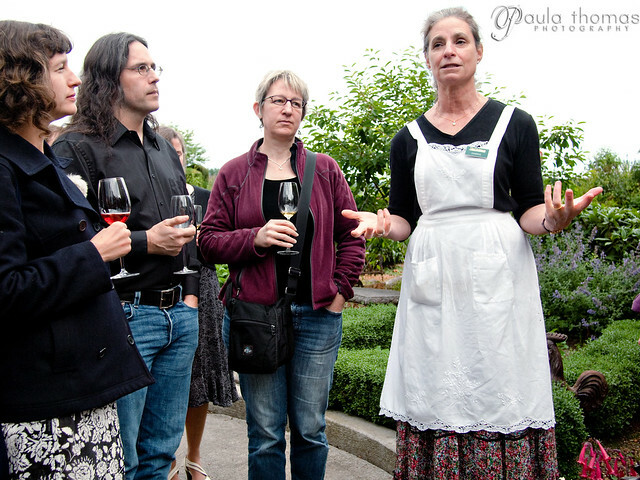 Halfway through the cherry cider, we headed outside for a tour of the herb garden hosted by Carrie, Ron's wife. We were able to bring a glass of wine out with us. It was a little difficult to take photos and carry around a wine glass at the same time, but I managed. I brought my smaller camera, the Olympus E-P1, so it wasn't as difficult. She told stories of how the Herbfarm started and pointed out some of the herbs in the garden and passed around some flowers for us to take bites of and other herbs were passed around to smell. Did you know chive flowers are actually good eating? That was one thing I learned and plan on looking for some recipes to try that out on. Last stop of the garden tour was the pig pen where we met two pot-bellied pigs named Basil and Borage. We headed back inside and were guided to our seats which had name tags. I sat at a table with a bunch of wine/cider makers. Across from me was Ron Irvine from Vashon Winery and next to me were Peter Ringsrud and his wife from Snowdrift Cider. Before the meal we went around the table and introduced ourselves to everyone and told a little story, preferably about apples. I didn't really have an apple story so I talked about my Herbfarm Cookbook Project that I've been working on. Shortly after our introductions our first course was served. 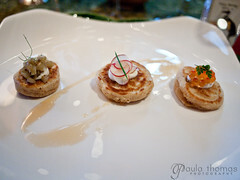 Three buckwheat blinis, each with different toppings. I ate them from left to right. The first was topped with fennel, next one with chives and radish and the last with smoked salmon roe and chervil. Of the three I liked the chives and radish one best. I'm not a big fan of roe, too fishy tasting to me so it was my least favorite. This was paired with a sparkling cider from Finn River. I've had sparkling cider before but I don't think I've had one that had alcohol in it. It was pretty tasty. Between the first and second courses, Ron Zimmerman, Ron Irvine and a couple cider experts talked about cider and how much it's grown in popularity over the years. During Ron Irvine's speech he surprisingly poured some of his cider onto the floor and it wasn't an accident. Only he was allowed to do that, not that I would want to anyway. For the second course, we had buttermilk fried rabbit leg with collard greens, cider and green tomato marmalade, bacon-fat-poached loin with corn bread puree and Fines Herbes. I don't remember if I've ever had rabbit before. If I have it was when I was very young and my mom probably didn't tell me I was eating rabbit. I thought it was great, it tasted a lot like chicken, for reals! Wescott Bay Traditional Dry cider was the pairing for this course. I don't think I've had a dry cider I haven't liked. 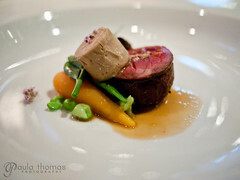 The third course was squab breast stuffed with foie gras and a carrot, pea, tendril, thyme flower, and squab jus salad. Pretty sure I've never had squab or foie gras before but I at least knew what they were from watching the Food Network. The squab was good but I'm not sure about foie gras. I think it's the texture of it that I'm just not a big fan of. 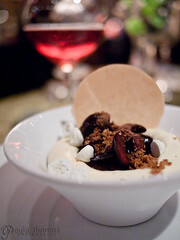 For some reason this dish had two cider pairings, Snowdrift Cliffbreaks Blend Cider and Wildfire Semi Sweet Ember. The online menu I saw before the dinner only listed Snowdrift so it must have been a last minute addition. Three courses down and we are halfway through the meal. The Fourth course plate came out with an applewood roasted pork neck with bacon-braised greens, boletus mushrooms, triple cooked potatoes, and a cider hay jus. I don't think I've ever eaten the neck of a pork before. I would have never guessed it was a neck. It was tender and tasty. I'm not a huge mushroom fan and luckily there weren't a lot of mushrooms in the dishes. I don't mind them much if they are soaked and cooked in something enough to take away most of the earthy flavor. I didn't even notice them since they were cooked and seasoned well. 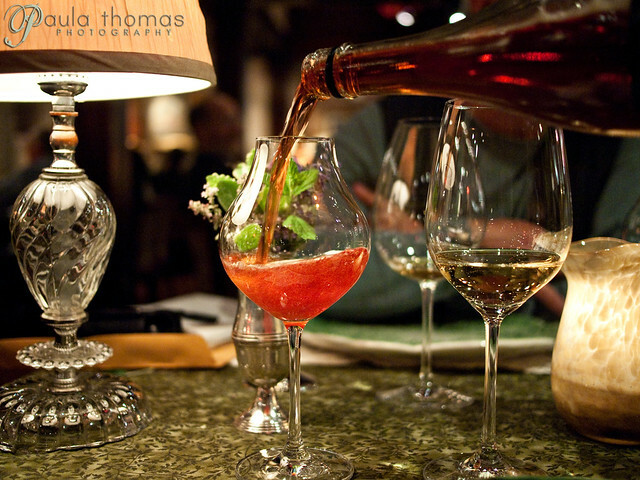 Red Barn Tulip Valley Burro Loco Crabapple cider was the pairing for this dish. The 5th course seemed more like an appetizer to me. This course was a slice of Estrella Family Creamers cheddar cheese with some house cured prosciutto, arugula, and Eaglemount ginger cider vinaigrette. 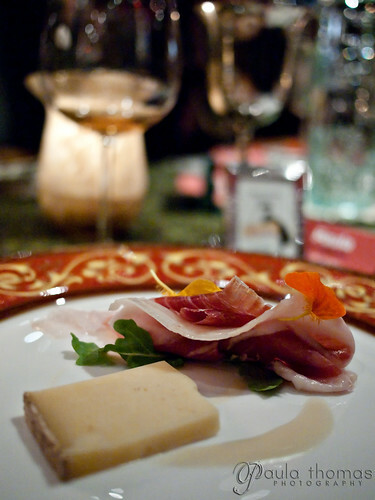 It looked like there were also some nasturtium petals on the prosciutto. Which reminds me I have some nasturtium seeds that I bought and still haven't planted in my hanging baskets. I better get on that if it's not too late. 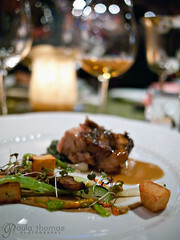 This course was paired with Wandering Angus Bloom Cider. By this time I was starting to get a little full so I didn't eat quite all of this one because I wanted to save some room for the dessert course coming up. We get to the final course, dessert. Balsamic macerated bing cherries topped a dark chocolate encrusted chocolate hazelnut ice cream with french sage meringue and English sage marshmallows. I almost never order dessert when going to a restaurant unless I get it to go because I never have room for it so it was no surprise that I wasn't able to finish it all but it was delicious. It was paired with a sweet Blue Mountain Cherry Cider. I'm not usually a big fan of sweet ciders but the cherry ciders I had that night were both surprisingly good. Just when I thought dinner was over, an after dinner drink menu was brought out that was filled with tons of teas and coffees. I went with the Smart Tea which consisted of lavender, rosemary, and peppermint and is not caffeinated. It also came with an IQ quiz which you were to try before drinking any tea and then again after drinking it. The Smart Tea is supposed to make you smarter but I didn't do any better after drinking it. While sipping on my tea I decided to look at my watch. I hadn't looked at it all night and had no clue what time it was. I was surprised to see that it was already 10:30. While sipping on tea another small plate of about 10 bite sized pieces of sweets came out. I only managed to eat one of them before heading out. The dinner was a great experience and I had fun touring the garden and meeting some people and of course the food and ciders. I didn't realize there were so many local cideries around. I don't think I heard of any of the ones I drank that night. Some of them you can buy from various Whole Foods and others can only be bought directly from them. Here are a few more photos from the dinner and even more can be found on my SmugMug site. It was so wonderful reading your words and the photography beautiful. 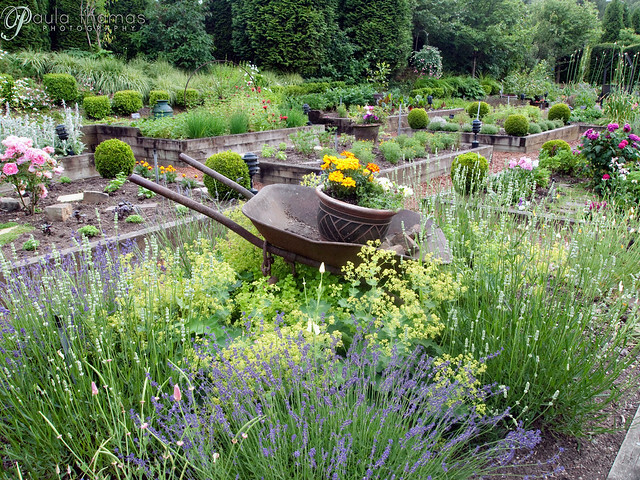 What a special place the Herbfarm is. Just went last night. These are great photos!